The brazen terror attack on British parliament which killed four people ended within 82 seconds and was carried out by Khalid Masood who acted alone, Scotland Yard confirmed, conceding they may "never understand" the 52-year-old attacker's motive. Detectives from the Metropolitan Police's Counter Terrorism Command confirmed after detailed probe that the attack started at 14:40:08 (local time) on Wednesday when the car that Masood was driving over Westminster Bridge first mounted the northbound pavement. He continued towards Bridge Street along both the footpath and road until 14:40:38 before crashing into the perimeter fence of the Palace of Westminster. At 14:40:59, the first 999 call was made to the Met, reporting the incident, it said. Masood left the vehicle and was shot by a police firearms officer inside the Palace of Westminster boundary at 14:41:30. "Our investigation continues at pace. I am grateful for the public support so far, but I am asking for more help. 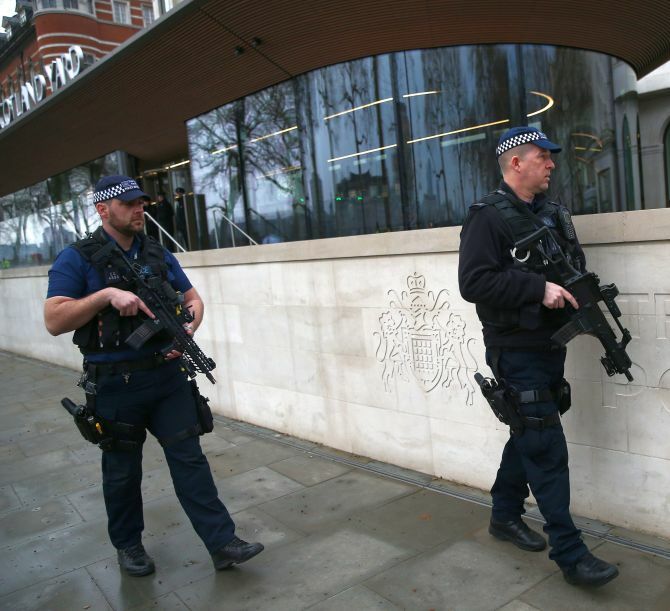 If you knew Khalid Masood and had spoken to him in the months, weeks or days leading up to this attack please come forward," said Met police Indian-origin Deputy Assistant Commissioner Neil Basu, who is the Senior National Coordinator for UK Counter Terrorism Policing. "We still believe that Masood acted alone on the day and there is no information or intelligence to suggest there are further attacks planned," Basu said. His remarks came after two of the 11 people arrested in connection with the attack were questioned by police to establish whether the attacker acted alone or had associates. "Whilst the attack lasted only 82 seconds it will remain in the memories of many forever. The thoughts of all those working on this investigation are with those so deeply affected," Basu said. "One person remains in custody in connection with the attack after 11 arrests in the aftermath of the attack," he said. Born as Adrian Russell Ajao in Dartford before converting to Islam, Masood was known to UK police and intelligences services. He was born to a white mother and black father and is said to have been affected by racism while growing up. "Even if he acted alone in the preparation we need to establish with absolute clarity why he did these unspeakable acts to bring reassurance to Londoners, and to provide answers and closure for the families of those killed and the victims and survivors of this atrocity," Basu said. "We must all accept that there is a possibility we will never understand why he did this. That understanding may have died with him. "Nevertheless, we are determined to understand if Masood was a lone actor inspired by terrorist propaganda or if others have encouraged, supported or directed him. If the latter proves to be the case, they will face justice," he said.